Fellbach vineyards, from Hotel Alte Kelter. Klaus and I shall drive east across Germany and Austria, stopping to meet Herr Hari S. at the Ural dealership in Marchtrenk, then probably stopping for the night in the Vienna area (likely, in Western Hungary). The next day I shall traverse Hungary, enter Romania at Petea, just north of Satu Mare, then proceed to Ocna Şugatag for a couple of restful days in Maramureş. I have booked a room at Popasul din Deal, a wonderful inn owned by my friend, Vasile Pop. The next planned event is the wedding of my former student and adopted niece Dora, who, when she was a UBB undergraduate back in 2008, guided me through several of the monasteries of Moldavia. That sacred event will take place in Bistriţa on 1 June. From there, probably on 2 June, I hope to arrive in Cluj to move into the apartment that I have arranged for in Zorilor, a nice section of town on the hill above the Botanical Garden. On June 7th and 8th, I shall participate in a management conference at the Faculty of Economics (FSEGA) at UBB, which will be a homecoming of sorts, for I have taught there for three of the past ten semesters. I cannot wait to visit again with a number of respected colleagues and friends there. The next ten days are a vacation! I shall use them to revisit many people and places in Romania, and to meet, in person, a few new friends that I have been corresponding with on the Internet. Hence, I expect to use Klaus a lot. He and I will roam southward to visit my Fulbright Commission friends and former students in Bucharest, perhaps getting to see Father Sava at the monastery at Oaşa on the way. From 20 to 22 June, I am scheduled to give a talk at the 2nd International Conference on Sustainable Business at Opole University in Opole, Poland. It is not yet clear how I shall travel there, but if I (or we, for some Romanian colleagues may also be going) drive, I hope to detour on the way there or back via Prague, as I have never seen that city of legendary architectural grace. At the end of June, as I head once again to the west to return Klaus to his home in Fellbach, I hope to visit once again my friends in Covasinţ, and in Timişoara. 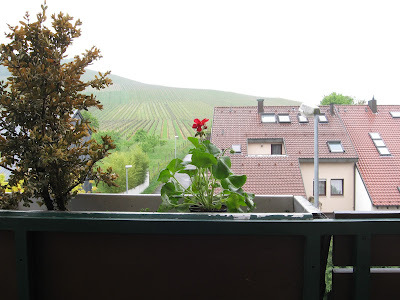 Once back in Fellbach, Germany, early in July, I plan to stay for another day or two at the Alte Kelter in order to have a good visit with the Familie Schmid, our friends of 25 years, who are the generous keepers of Klaus. Please wish me well on this journey, and if you will be in Plymouth or Campton, New Hampshire, during June, please stop by our home, and see Shirl. Shirl was invited on this adventure, but has chosen to "hold the fort" at "Hotel New Hampshire," along with the two Romanian graduate students who live with us. I am quite sure Shirl would welcome some friendly company (provided you call her first, of course)!